Perry Cook's only home in his eleven years of life has been at the Blue River Co-ed Correctional Facility in Surprise, Nebraska. Yes, prison. Thanks to the vision of a forward-thinking warden, Perry has been able to stay with his mom and has come to know the inmates like family. The warden sees Perry's presence, the presence of young innocence, as a beacon of hope to for the residents at Blue River. But when Thomas VanLeer, the new district attorney in Surprise, Nebraska, hears that a child is living at Blue River, he forces Perry from the only home he's ever known and puts him into a foster home -- his home. Which also happens to be the home of Perry's best friend Zoe because VanLeer is also Zoe's stepfather. Not only is VanLeer keeping Perry from his mother, he is also (somewhat questionably) holding up her parole hearing due to his desire to conduct an investigation into any wrongdoing by the warden and the prisoners in allowing Perry to live at the prison. While Perry is incredibly upset and resentful toward VanLeer for keeping him from his mother, he still manages to conduct himself with grace, dignity, and savviness beyond his years. 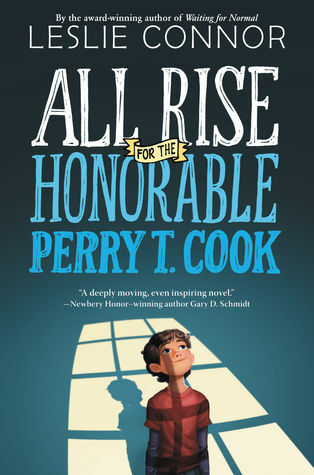 All Rise for the Honorable Perry T. Cook is a wonderful, heartfelt middle grade novel full of memorable, lovable characters. The story is meant to make you stop and think what it really means to be part of a community and how we view people who are incarcerated. Because this book brings forth those questions of community, Perry's story would be one worth reading aloud to a classroom full of upper elementary students to get kids thinking about what makes communities thrive -- even ones you wouldn't expect, like a prison community. This one was a lot happier than it could have been I do love this author and am always excited when she publishes something new!